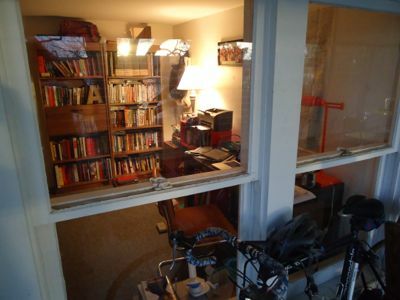 Here’s another shot of the office, from the porch looking in. I took this because of the view I was enjoying looking out on Monday. See? So lovely. 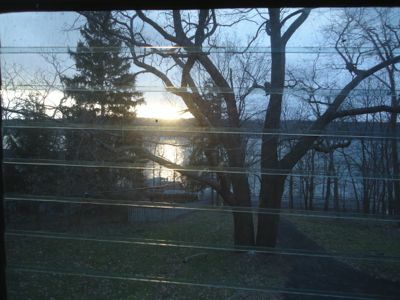 I was too busy writing to capture today’s afternoon and early evening light, but it was beautiful — sort of like this, but with flurries of snow. 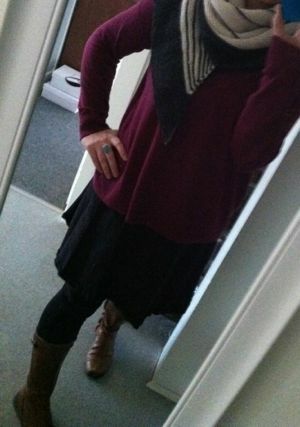 And because in theory, we all show up here because there is knitting, here’s what I wore to campus (first day back there since the end of August) today: my stripe study shawl, boots, leggings, a dress, and a slouchy sweater. It was nice to say hello to the folks in the office, chat with my chair, and cross a bunch of logistical things off my list. Hooray! Time for dinner, some knitting, and a book. This entry was posted in grad school and tagged grad school, habits, knits in action, resolutions, stripe study shawl, sunset, winter, writing by barefootrooster. Bookmark the permalink. Good luck with the writing habit. It’s something I’ve tried to cultivate on and off for awhile. It’s an off time hoping to be an on time right now. I think you’re on the right track. I find it’s always easier to get something done if it’s part of a daily habit — it almost feels like I have to do it or my day will be off, so it doesn’t become something I dread. I hope you have success with your plan! You make that stripe study shawl look so good (love her patterns!). Doesn’t this seem like the perfect time of year to work on creating a writing habit? Though the outdoors is still beautiful, it doesn’t beckon quite as much as in the warmer months. May your habit grow strong this year! Love the shawl, looks very cute with the outfit. Your resolution is the same as my resolution–and I hope they both go well this year. I had a pretty good daily writing habit last summer, to the point where it felt pretty good to sit down for a couple hours, then, surprise, there was some writing I felt good about, but it was an easy habit to lose once the crazy move started. Why can’t writing be one of those habits that’s easy to get and hard to lose instead of the other way around? High five! And right on … developing a more mindful writing practice is totally on the top of my new-semester list. I’d love to hear more about yours, what works for you, etc. if you ever feel like sharing more here … and yay for first days back! Happy writing! p.s. I’m totally with Eileen. Sigh. Building a routine that makes you happy (or at least content) is so important! 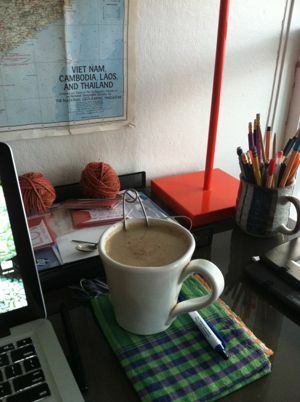 I love my morning coffee/email ritual, and I’m enjoying building new workflow habits. The stripestudy shawl looks terrific! I awoke to a light dusting of snow on January 1st, but that’s about it for Chicago.